The word Bauernmalerei, pronounced Bow-urn-mall-er-eye, translates as "peasant painting" from German. 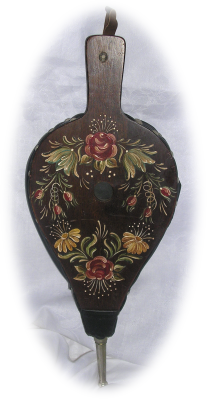 Although this primative country folk art evolved in Germany, Austria and Switzerland throughout three centuries and included many different regional styles, today it is all referred to as Bauernmalerei. 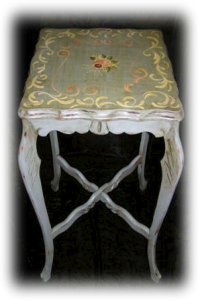 It is often called "Bavarian Folk Art" because Bavaria is the largest area in Germany where this old world art can be found. 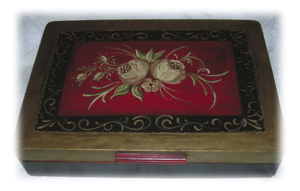 Pat Charlton started her craft over 20 years ago when she fell in love with the Bavarian decorative art "Bauernmalerei" while living in Germany. 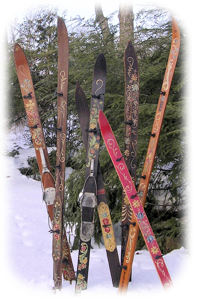 With an untrained hand, Pat has skillfully used this art form on all kinds of home furnishings to enhance one's home decor: hand-painted, recycled furniture, vintage wooden skis and decorative accent pieces and accessories such as bellows, mirrors, jewelry boxes, lamps and straw rugs. 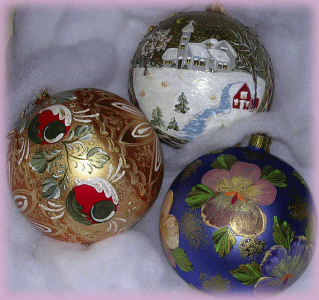 Within the past 10 years Pat applied her Bavarian decorative artwork to hand-painted glass Christmas ornaments, many of which can be hung year-round. Copyright � 2009 Pyxis Computing | Design by Wes Matchett.